Atrial fibrillation is an abnormal heart rhythm. The heart's electrical system normally sends regularly spaced, predictable signals, telling the heart muscle to contract, or beat. The heart has two upper chambers, called atria, and two lower chambers, called ventricles. Each signal starts in the atria and travels to the rest of the heart. 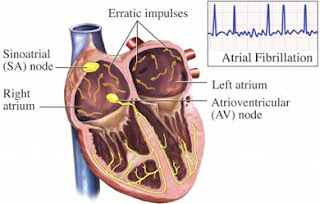 In atrial fibrillation, the electrical signals from the atria are fast and irregular. The atria quiver, rather than contract. Some signals do not reach the ventricles and the ventricles continue pumping, usually irregularly and sometimes rapidly. This uncoordinated rhythm can reduce the heart’s efficiency at pumping blood out to the body. Blood left in the heart chambers can form clots. These clots may sometimes break away, travel to the brain, and cause a stroke. In most cases, atrial fibrillation is due to an existing heart condition. But atrial fibrillation can occur in people with no structural heart problems. A thyroid disorder or other condition may cause the abnormal rhythm. In some cases, the cause is unknown. Symptoms can vary from mild to severe, depending on your heart function and overall health. Some people may not notice any symptoms. If an underlying cause of atrial fibrillation is found, it may be treated. Some patients return to a normal rhythm without treatment. Cardioversion is a procedure that uses an electrical current or drugs to help normalize the heart rhythm. If atrial fibrillation has lasted 48 hours or more, you may be given blood thinners before this procedure. In some cases, an area of the atria that is deemed to be responsible for the atrial fibrillation may be surgically removed or altered (ablated) with various techniques, including cryoblation or radiofrequency ablation , to prevent it from persistently generating the rhythm disturbance. Avoid caffeine and other stimulants because they may trigger another episode. Alcohol may also act as a trigger in some people. If you have risk factors for atrial fibrillation, avoid known triggers, such as alcohol and caffeine. Follow your doctor's advice for controlling heart disease, high blood pressure, and other conditions.